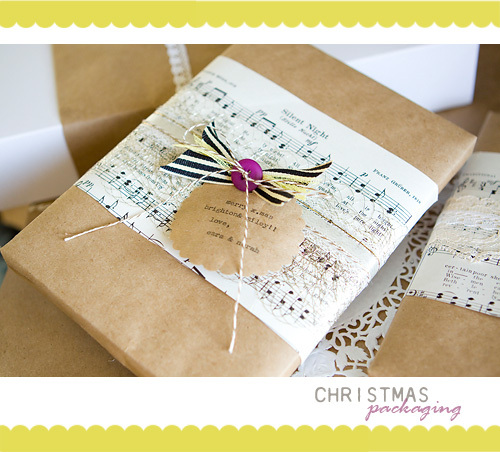 here is another re-post of my christmas packaging / wrapping from last year. a big part of the fun of gift-giving for me is the packaging. i used a lot of my favorite things: vintage music sheets, paper doilies, lots of lace, buttons, ribbon, kraft paper, my old school type writer, and bakers twine. i am hopping to get all our presents for this year ready and wrapped in the next few days. wish me luck! how are you wrapping your presents this year?! I take pretty images from magazines and collage them together to use as wrapping paper. I usually wrap twine around it and do some sort of flower or fan thing from the left over magazine pages. It's so fun! your gift wrap is gorgeous. i really love the sheet music detail. Okay, so I wrapped my first (maybe 5) gifts all pretty with twine and paper doilies….then the rest I got lazy, wrapped them, and then wrote the name with a marker on the wrapping paper. Can you say GHETTO! This is so pretty and quite simple to do this. 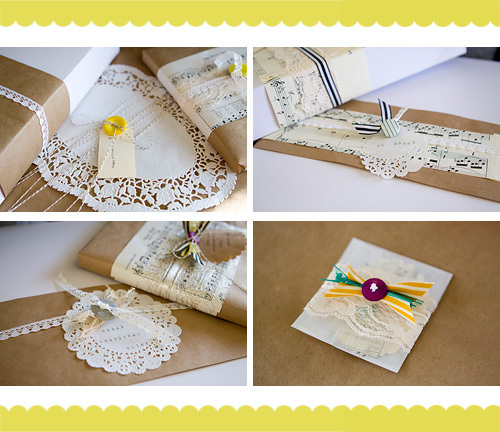 Paper doilies adds so much elegance to this gift wrapping. love this! especially the music!!! hmmm. gets me thinking… I could photocopy the music and then tea-stain it really quickly in hot water. dry. and then use to wrap! Thank you for the awesome inspiration.